Tue., May 16, 2017, 6:08 p.m.
Wednesday, May 17: Seattle Sounders at Sporting Kansas City, 5:30 p.m.
There’s been a distinct, but disturbing, rhythm to the matches the Seattle Sounders have played thus far this season. The incumbent MLS champions have a target on their back this year, and so far, the Sounders have struggled to come out on top. Seattle heads into Wednesday’s road tilt at Children’s Mercy Park against Sporting Kansas City (5-2-4 MLS) sitting in ninth place in the MLS Western Conference standings, with a 2-4-4 record in MLS play. “It’s a bit of a shock to look at the standings and see that we only have two wins, based on the way we’ve played some of our games,” Schmetzer told reporters after the Sounders’ 4-1 defeat in Chicago on Saturday. But a big reason for the Sounders’ early season struggles is the revolving door on their back line. Thanks to a rash of injuries, the Sounders have yet to play a match with their first-string group of defenders this season, and they’ll have to face Kansas City’s creative striker Dom Dwyer (5 goals) with yet another retooled backline. “We’re dealing with a couple of makeshift lineups, and we haven’t been very consistent in our back four at all,” Schmetzer said. Chad Marshall has struggled with back issues, Roman Torres remains sidelined by a hamstring strain and Oniel Fisher is recovering from a hamstring strain. Right back Brad Evans also missed nine games with a calf injury, though he made his season debut as a second half sub against Chicago last weekend, and will likely see his minutes increase as the club tries to phase him back into the lineup. Still, until now, the only constant on that back line has been left back Joevin Jones, who is fourth in the MLS in assists and has started all 10 games this year. However, Jones will miss Wednesday’s game due to a suspension after picking up two yellow cards against Chicago on Saturday night. But perhaps the Sounders’ defense has already hit rock bottom because for once, the list of players returning looks promising. Schmetzer at least goes into Wednesday’s match with enough bodies on defense that he won’t have to shift midfielder Cristian Roldan to right back again the way he did against Chicago to cover for Jordy Delem, who was suspended for the game after incurring two yellow cards against Toronto. It also helps that Nouhou Tolo is back from injury (shoulder dislocation). Between Delem’s return and Evans, Fisher and Tolo’s improving health, Schmetzer can only hope that his defense continues to get stronger from here on out. Schmetzer said he’ll make game-time decisions on Evans, Fisher and midfielder Osvaldo Alonso (tight quad – listed as questionable) though he doesn’t think Evans is healthy enough to start at right back quite yet. “I know he’ll give us minutes, I’m just not sure he’s ready to start for 90 minutes, Schmetzer said of Evans, who entered the game against Chicago in the 81st minute. “We’re working through that to make sure we’re not putting him through any injury risk. In the grand scheme of things, Schmetzer says, the problems on defense are a major reason the Sounders have been inconsistent this year, but stresses that it’s too simplistic to label the injuries on the backline as the root of all Seattle’s problems. 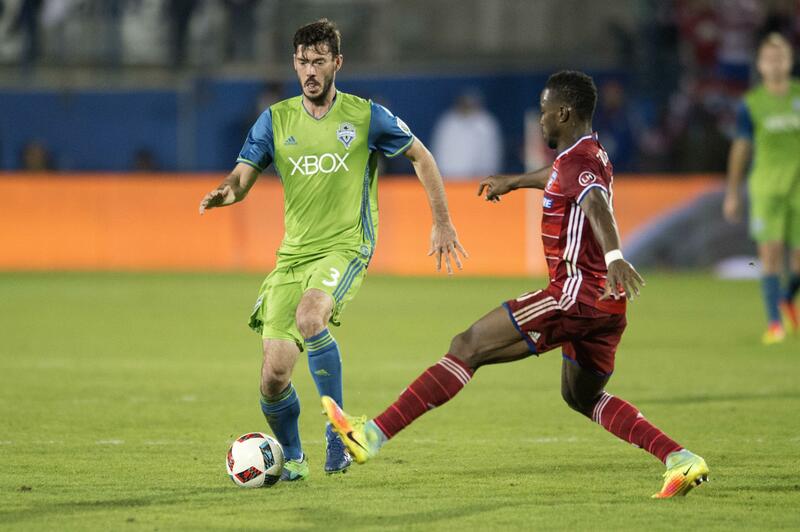 In a way, it’s good that the Sounders had a quick turnaround on the road this week. Published: May 16, 2017, 6:08 p.m.